← Hope Not Hate blog – two wrongs do not make a right! Privatisation by the Back Door? – Nope they’re coming right in the front! A while back a letter dropped on my mat and I ripped it open carelessly expecting yet another piece of unsolicited junk mail. At first it didn’t seem so, as it was from my local GP Practice, so, as with all things medical I read it with a little trepidation. After all, when you get to my age your mortality is never far from your mind and I assumed it was going to tell me of an opportunity for me to call in for a test for one or more of the horrible conditions or diseases that seem to be waiting around the corner to mug me at any moment. It’s not a question of whether it seems now a days, it’s simply a matter of when. Is it already too late? Or have I just enough time to get down to the surgery before I am doomed to a painful and slow death from one of the many conditions that could kill me at any moment. Have I got time to walk there? Or should I get a taxi? Well, as it turned out my first thought was in fact correct. It was junk mail – although I had to read it a couple of times just to confirm the fact. After all you don’t expect junk mail from your GP do you? At least I don’t. The NHS and I are roughly the same age and it has always been for me a source of immense pride. In a time when it seems that we know the price of everything and the value of nothing, the NHS is one of the few things, along with libraries, that are for me an indication of a civilised society. Yes, it has its problems and I have no doubt it could be managed better. That is not really a question of money it seems to me, that is just common sense, everything can. But it is not a question of ‘ownership’ – our banks can attest to the fact that managerial incompetence is not limited to the public sector. Please also explain to me which privatised utility has improved out of all recognition, Gas, electricity, water, railways, I remember the inefficiencies of all of them – but those inefficiencies have continued in the private sector it seems to me, the only difference being everyone pays more for it and a few, well-healed individuals pocket the profits. So back to my ‘doctor’s letter’. What I got was a letter that explained that ‘I was entitled to be informed’ of my private health screening options and to get around the Data Protection Act 1998 I could consent to an abuse of my private medical records (I am paraphrasing of course, they put it a lot less scarily!) by calling a call-centre. Are their actually people out there who voluntarily phone ‘call centres’ unless imminent death is a consequence of failing to do so? As a result of this simple call I would then be entitled to be bombarded with, (sorry, benefit from), further junk mail offering chargeable screening options, that I can select from a menu – I could even pay with my credit card, just to help me out. Prior to my call however, they take the opportunity to include a leaflet with a selection of tests I can buy online ranging from £40 to £159 (buy now and save £46! – what a bargain) some of the results are actually read by a Consultant Cardiologist apparently. Well, who reads the others, the bloody caretaker? It also appears you might bump into these people where you least expect them, like in your GP surgery where they apparently pay ‘a nominal fee’ for the use of one of the few places one might expect to be safe from the grasp of these people. Allowing these companies into our surgeries is like allowing piranha in a public swimming pool and it is an awful idea. 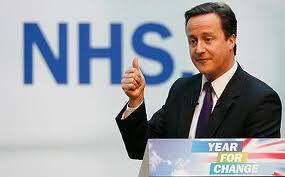 Cameron and Co’s ‘initiative’ for the NHS has been accused of being privatisation by ‘the back door’. That is, of course, nonsense. They are coming straight in through the front door and not even stopping to wipe there feet! These abuses of the NHS must be stopped now! This entry was posted in NHS, politics, social justice, Society First, welfare state and tagged Data Protection Act 1998, General practitioner, Health care, House of Lords, National Health Service, NHS, Private sector, Privatization. Bookmark the permalink. 1 Response to Privatisation by the Back Door? – Nope they’re coming right in the front!